The platform bakes deep learning, machine learning, predictive analytics and natural language processing across the Salesforce cloud. The near future of artificial intelligence (AI) won't be defined by ushering in a race of sentient machines. While we're inching closer to the goal of AI brain mapping, the next era of AI will be more about imbuing the software and applications we use every day with deep learning, machine learning, predictive analytics and natural language processing (NLP). Those capabilities will run under the surface, along with serving as tools upon which to build. It's about making AI a given rather than a novelty. Customer relationship management (CRM) giant Salesforce unveiled its plan for more accessible, natively integrated AI for businesses today with the announcement of Salesforce Einstein, its "AI for CRM" technology. 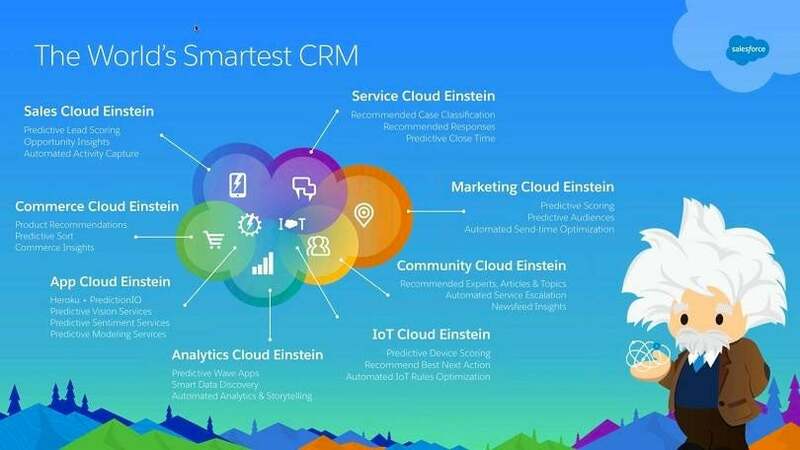 Einstein will be deployed across the Salesforce cloud to analyze the mountain of automated data the platform collects -- activity data, sales, email, e-commerce and calendar, social data streams and Internet of Things (IoT) data -- and run machine learning and predictive analytics algorithms, NLP and what the company calls "smart data discovery" to offer data insights and recommendations across different business use cases within the platform. Many of the capabilities will also be offered as developer tools to build AI applications on Salesforce. In the main Salesforce Sales Cloud, Einstein shows itself in a couple of ways. A feature called Predictive Lead Scoring, where a machine learning model analyzes industry and engagement data, is designed to help sales reps focus on the most promising lead.You can also use predictive scoring in other areas of the Salesforce Marketing Cloud, such as gauging prospective customer response to an email marketing campaign. In that scenario, Einstein could return results based on common customer behaviors and deliver advice like automated send-time optimization based on when subscribers have been historically most engaged. 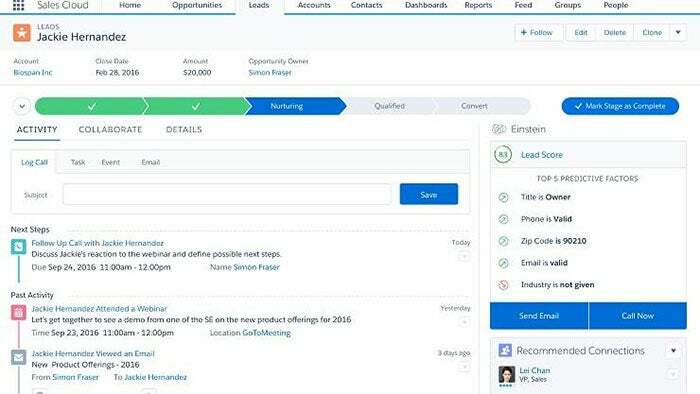 Another CRM AI feature called Opportunity Insights analyzes customer interactions such as inbound emails to alert sales reps to which way a deal is trending. Another core aspect of Einstein is AI-powered app creation. Einstein will be available in the Salesforce App Cloud and Lightning App Builder as a set of tools that allow developers to train AI apps by using deep learning tools. Richard Socher, Chief Scientist at Salesforce, was on-hand during the briefing to discuss the new Salesforce Research Group, a team of data scientists and researchers focusing on deep learning, NLP and computer vision innovation. As with Google's open-source TensorFlow toolkit, Socher explained how Einstein's developer tools are aimed at making deep learning more accessible using the Predictive Vision image analysis in Social Studio as an example. From a market perspective, Salesforce is essentially using AI techniques such as machine learning and predictive analytics the same way as Google, Facebook and others do for consumers, only for its vast quantities of sales and business data. Brandon Purcell, Senior Analyst at Forrester Research said an AI layer such as Einstein between its data and apps gives Salesforce an opportunity to leverage its business data on that same scale.